A new study, almost two years of investigations, revealed that the U.S.-led bombing campaign on Raqqa, Syria in 2017 killed an estimated 1,600 innocent civilians while leveling the city on a scale unparalleled in recent decades. The report, "Rhetoric vs. Reality: How the 'Most Precise Air Campaign in History' Left Raqqa the Most Destroyed City in Modern Times, confirm that the U.S.-led coalition has admitted to just a fraction of the civilian carnage it has caused in Syria, even as it has boasted of the care it's taken in avoiding such casualties and the precision of the Raqqa offensive. 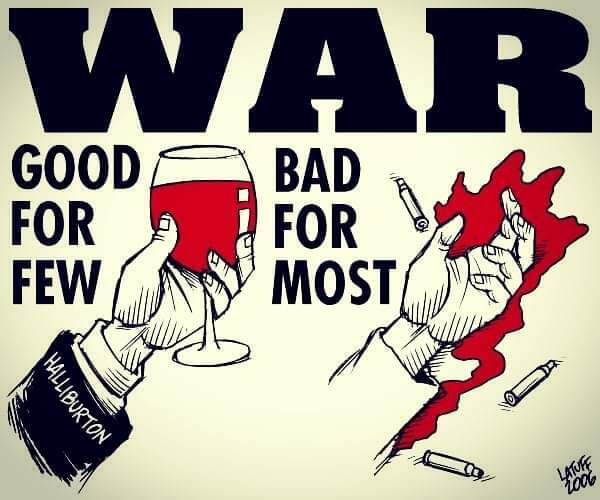 According to the report: "US, UK and French forces also launched thousands of air strikes into civilian neighborhoods, scores of which resulted in mass civilian casualties." U.S. Lieutenant General Stephen J. Townswend, commander of the coalition, who said, "I challenge anyone to find a more precise air campaign in the history of warfare…The Coalition's goal is always for zero human casualties." Researchers argue the evidence belies those claims and, as part of the report, both groups demanded accountability for what was done to the city and its people. The U.S. has claimed to have unleashed 30,000 rounds of artillery on the city during the offensive, while the U.K. and France helped to carry out thousands of air strikes. The U.S. strikes represent the equivalent of one strike every six minutes for four months. "When I first came to Raqqa after the war, I knew that relentless American, British, and French bombardment killed civilians and destroyed much of the city," Rovera said. "What I came to discover was that little or no protection was afforded to the thousands of civilians who were trapped in the city," she added. "Raqqa is the most destroyed city in modern times in terms of percentage. There is no part of Raqqa which has been left untouched. Many of the air bombardments were inaccurate and tens of thousands of artillery strikes were indiscriminate, so it is no surprise they killed and injured many hundreds of civilians,” said Rovera. While in Afghanistan, pro-government and international military forces in Afghanistan were responsible for more civilian deaths in the first three months of 2019 than the Taliban and Islamic State-Khorasan militant groups. The mission attributed 608 civilian casualties (305 deaths and 303 injured) to pro-government forces, representing a 39% increase from the same period in 2018. UNAMA attributed 17% of overall casualties to the Afghan national security forces, 13% to international military forces, 2% to pro-government armed groups, and 2% to multiple pro-government forces. Anti-government elements remained responsible for the majority of civilian casualties, causing 963 civilian casualties (227 deaths and 736 injured), representing a 36% decrease as compared with the same time period in 2018. Living costs have increased faster for Britain’s poorest households than for the richest, according to official figures, amid a squeeze on living standards for low-income families that has lasted more than a decade. Costs for the poorest tenth of households in Britain had risen by 2.7% a year on average between 2006 and 2018, compared to an increase of 2.3% for the richest tenth. Cumulatively since 2005, the costs facing low-income households have risen by 41%, while costs for high-income households have risen by 35%, according to the ONS. The assessment comes as households across the country have faced a squeeze on incomes in the decade since the financial crisis – from weak growth in pay and rising living costs to government austerity and benefits cuts. A House of Lords committee on intergenerational fairness and provision said it was time to rebalance government policy in favour of the young. Nicholas True, the chairman of the Lords committee, said: “We are calling for some of the outdated benefits based purely on age to be removed." The report said the triple-lock – which raises state pension payments in line with the highest of consumer price inflation, average earnings growth, or 2.5% – should be removed. Free TV licences for over-75s should be scrapped. The age threshold for free bus passes raised by at least five years after state pension eligibility. The age when receive winter fuel payments should also rise in the same way. These could be phased in to coincide with the state pension age rising to 67 from 2026. Scrapping the free TV licence for over-75s could push 50,000 older people into relative poverty. Getting rid of the pensions triple-lock could potentially push up to 700,000 pensioners into poverty by 2050, according to the Pensions Policy Institute. The trust demanded urgent changes to the UK benefit system as it recorded a year-on-year 19% surge in the number of food bags it gave out, the biggest annual increase for five years. Its emergency food supplies has grown for five consecutive years – a 73% increase overall – the charity warned that food banks could not keep expanding indefinitely to cover for a failing social security system. The trust’s figures show that a fifth of all referrals to food banks last year were linked to delays in receiving benefits, and almost half of these were related to universal credit. Many claimants do not have the savings to cope with over a month without income, putting them in rent arrears. Aside from universal credit, the trust reported that a third of referrals to food banks last year were as a result of “low income” – meaning those referred were unable to meet the cost of living, the majority as a result of inadequate benefits income. Most working-age benefits have been frozen since 2016. We have no way to fish, to get food, to bathe," said Angoho Ha-ha-hae, the wife of the leader of the Pataxo tribe, whose water source was destroyed when a dam burst earlier this year. "We depend on the government, and where is it? We need help." "Since the government of Bolsonaro took office, several measures have been implemented that directly affect the rights of indigenous people," says Luiz Eloy Terena, Articulation of the Indigenous People of Brazil (APIB) 's legal counselor. Terena told Al Jazeera some of these measures include the transfer of land demarcation and environmental licensing to the Ministry of Agriculture, and the extinction of the government offices responsible for the education and health of indigenous people. "The president's statements defending mineral exploration in our lands and this idea that native people should be integrated and assimilated," he said. "This year's Free Land Camp is happening because of all of those things". APIB has documented a "series of attacks and invasions" of indigenous lands, as well as "persecution, racism and intolerance" shown toward native people since Bolsonaro took office at the beginning of the year. Several other indigenous organisations have also denounced land conflicts and a substantial increase in violence since January. Many believe the government's relaxed stance on environmental issues is giving farmers and companies the green light to disrespect existing limitations, especially in the Amazon. Joenia Wapichana, the first indigenous congresswoman in Brazil, said during her short time in office that "the government is not open" to the indigenous struggle. "The government is completely anti-indigenous," she told Al Jazeera. "Jair Bolsonaro is only open to those who defend mining and land grabbing, which is his intention." APIB accused Bolsonaro's government of wanting to "exterminate the indigenous peoples of Brazil" and not being available to "hear" and "help" them. "Our camp has been happening peacefully for the past 15 years to give visibility to our daily struggles. We are not violent, violence is attacking our sacred right to free protesting with armed forces," the group said in a statement. This week's events will include a vigil in front of the Supreme Federal Court to demand more land demarcation. On Friday, the indigenous communities are expected to march towards the National Congress. American corporate profits are at 80-plus year highs, and the S&P 500 has broken previous records nearly 30 times in the last five years alone, real wages for the lowest-income workers have barely risen in four decades. And today, nearly half of all workers make less than $15 per hour – roughly $30,000 annually for a full-time job. Outsourced workers earn much less than their non-contracted peers – 15% less for contracted janitors, for example, compared with those working in-house, and 17% less for contracted security guards relative to comparable direct-hire guards. Short-termism pervades corporate boardrooms and C-suites, as companies increasingly fixate on delivering immediate value for shareholders at the expense of longer-term investments in wages and training for workers. A 2016 report by FCLT Global found that 87% of executives and directors are pressured to deliver a strong financial performance within less than two years. An earlier study by McKinsey found that nearly 80% of surveyed chief financial officers at America’s largest public companies said that they would sacrifice longer-term economic value in order to meet quarterly earnings expectations. Illustrative of this trend is the massive wave of stock buy-backs, in which companies, desperate to please shareholders, purchase their own shares in order to reduce supply in the market and drive up their prices. Before 1982, buy-backs were generally considered to be a form of market manipulation, but in the decades since, as a result of a change in federal policy, they have become a staple of corporate decision-making. According to the economist William Lazonick, between 2007 and 2016 companies on the S&P 500 dedicated 96% of their earnings to stock buy-backs and corporate dividends. That left just 4% for investments in the workforce, like raises for workers. And, in the wake of the Trump tax bill of 2017, a nearly $2tn giveaway to the largest corporations and wealthiest households, buy-backs surged to record heights, with over $1tn in share repurchases in the last year alone. Meanwhile, workers like ourselves can expect no such boost in our wages. Firms further exercise their power by embracing anticompetitive practices that keep workers stuck and wages down. Take the proliferation of non-compete agreements, covenants between employer and employee that restrict where the employee can work next. Historically, these agreements have been limited to workers with highly specialized training or possessing trade secrets; today one in seven workers earning less than $40,000 a year reports having signed one – including, until recently, sandwich-makers at Jimmy Johns and line cooks at Burger King. Employers do it because they can. Extinction Rebellion are drawing a halt to their present protests to plan for future actions and, needlessly to say, the police will be reviewing their anti-protester tactics. It is undeniable that the protesters against climate change had success. Support and sympathy for them has grown substantially, as have their funds. They are reflecting the genuine concern of many people. Campaigners have issued three core demands to the government: to "tell the truth about climate change"; to reduce carbon emissions to zero by 2025; and to create a citizens' assembly to oversee progress. It is therefore still a mission unaccomplished as yet, for Extinction Rebellion. Unlike many green economists, the Socialist Party never says that capitalism can offer the solutions to climate change. We are not delusional enough to believe capitalism has the answers. Instead of offering any source of real hope regarding the sort of society that should take the place of capitalism, too many environmentalists suggest simply another form of capitalism's economics. Environmentalists do not usually dispute that the drive for profit underlies the move towards the planet's degradation. 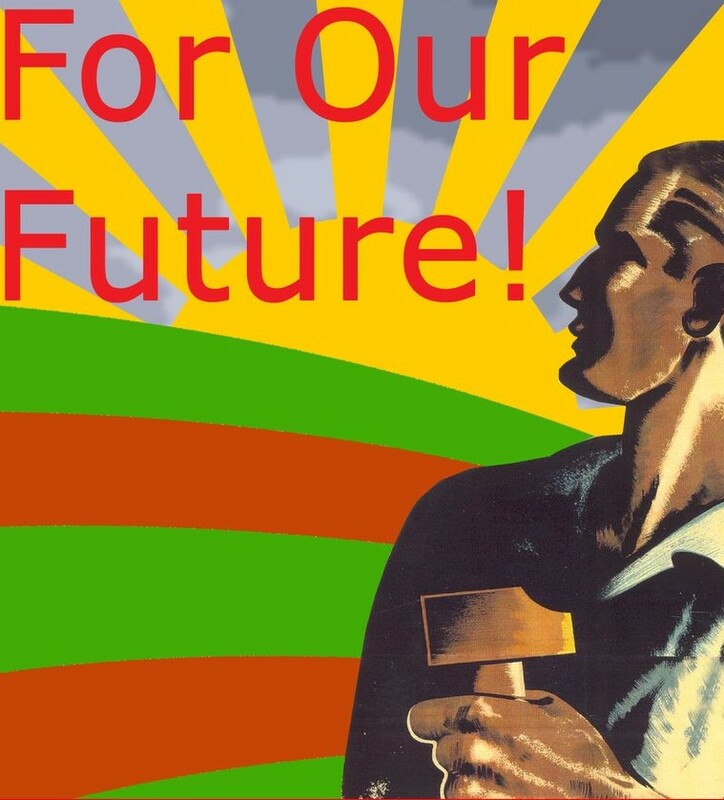 What they want instead is a “fairer” system of in which environmental and social needs are taken into account and as the Green New Deal suggests look towards sanctions to ensure compliance with regulations, funding for their enforcement, taxes and duties on environmentally damaging practices and so on. In other words, they unreasonably expect that the goal of increasing profits and expanding the market can be countered under the profit system. But it can’t. The profit system demands a system that allows profits to be maximised. The Green New Deal is setting out to impose on capitalism something that is incompatible with it. 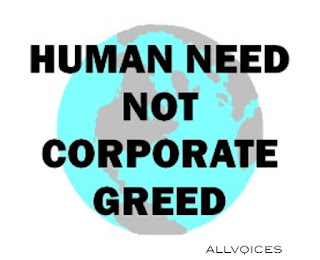 To protect the environment it is the whole global profit system itself that must go. Transforming the capitalist economy so that it works for the common good cannot be done. No State is going to implement legislation which would penalise the competitiveness of its national enterprises in the face of foreign competition. States only take into account environmental questions if they can find an agreement at international level which will disadvantage none of them. But that’s the snag because competition for the appropriation of world profits is one of the basis of the present system. Capitalism cannot go green because it simply cannot change its spots. 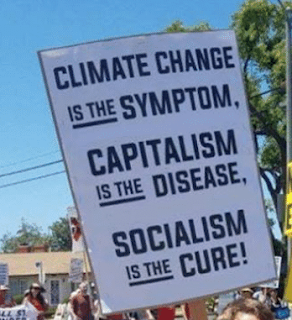 Many in the green movement argue that when the Socialist Party blame global warming and climate change on the capitalist system, the critics complain there is no room for debate or discussion about all the various reforms and policies offered by governments that appear to be meeting people’s needs. However, what the Socialist Party is attempting to point out is that the varied aspects of capitalism are interwoven together in a web of interrelationships and interactions that a vast system that operates by particular laws and so is incapable of adequate reform. The simple fact is that businesses will not take the risk of falling behind in the struggle for profits and nor will any government enforce policy that will result in a drop in the profits of its respective capitalist class. Capitalist businesses survive by forcing out their competition, by cutting costs and sidestepping policies that hinder their expansion. They seek new outlets for their wares, to sell more and more, because this is the law of capitalism, and it is a law antagonistic to ecological concerns. It is the crazed law of capitalism that compels the big oil producers to pay teams of scientists to prepare reports that refute the findings of environmentalists who forewarn of the dire effects of current production methods. The market economy demands that businesses only take into account their own narrow financial interests. Pleasing shareholders takes far more priority than ecological considerations. The upshot is that productive processes are distorted by this drive to make and accumulate profits. When socialists blame the capitalist system, we are promoting the idea that all social problems derive from the fact that a few individuals or countries own the means of producing the things we require to live. 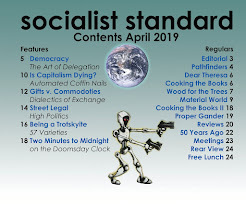 What the Socialist Party urges people to do is put aside preconceived assumptions about the way the world operates in order to create a new global system to end ecological destruction. The Socialist Party is no different from activists in the climate justice movement in desiring an environment in which the conservation of all animal and plant species is ensured, in a society in which each production process takes into consideration not only human need but any likely effect upon the environment. Where we differ is in recognising that their demands have to be set against a well-entrenched economic and social system, based on class privilege and property and governed by the overriding law of profits first. The history of capitalism is a history of radical movements that have opposed the exploitation and conflict upon which the system rests. Extinction Rebellion's resistance is to be applauded. Nevertheless, the Socialist Party's message to our fellow-workers in the Extinction Rebellion is not to prune back the system of exploitation, but to pull it up wholesale by its roots and turn the world’s resources into a common treasury for all. The Socialist Party seeks a radical transformation of the world where a sustainable society is achieved in which all the Earth’s resources, natural and industrial, have become the common heritage, under democratic control at local, regional and world level, of all humanity. Although Extinction Rebellion provides a lot of useful information it does not offer a solution to the present system. The continuation of capitalism on its blind and uncontrolled course is a gamble on the conditions of life itself. This is surely is obvious to anyone with a serious concern for ensuring a stable balance of natural systems in which humanity can enjoy being part of nature. Who are the ecological minded and defenders of the planet? Supporters of the Extinction Rebellion join us now. Civilisation will not survive capitalism. Greta Thunberg's visit to the UK is over and finished with a meeting to address British politicians. It was standing-room only, far different from the recent climate debate in parliament, which drew barely a dozen MPs even though it was the first on the climate crisis held in two years. Later, MPs held a debate on the floor of the Commons about the recent Extinction Rebellion protests and student strikes. Capitalism has been reformed many times and in many different ways and still it continues to progressively worsen the environment and in no way are things fundamentally changing for the better, neither for people nor for the environment. It would be correct to say that socialists view almost all of society’s problems as the inevitable outcome of the capitalist system. The threats and damage caused to our environment, become for socialists a symptom. A system based on profit and continued growth at all costs, places unsustainable demands on the planet's resources – and, in the end, must logically cause a civilisation collapse. And yet, faced with irrefutable evidence of catastrophic damage, the vast majority of people are not able, or perhaps don't wish, to make the connection. On the face of it the environmentalist movement has a lot in its favour. It is difficult to find fault in their concerns about how the planet is being abused. But is the solution that would save the planet from through a series of legal enactments. Prescriptions by environmentalists for people to change their lifestyles – to reduce their consumption of meat, to use public transport rather than private vehicles – will not resolve the crisis. The question of ‘how can we maximise profits?’ currently gets priority. This short-termism has prevented progress on a whole range of environmental issues. Which methods are sustainable? Environmentalists rightly show how many of our current methods of production are not ‘sustainable’ in that they damage the environment for future generations and they have offered many alternatives. Such methods could only be used to their full when we remove the market forces that drive producers to the short-term, cheap methods. 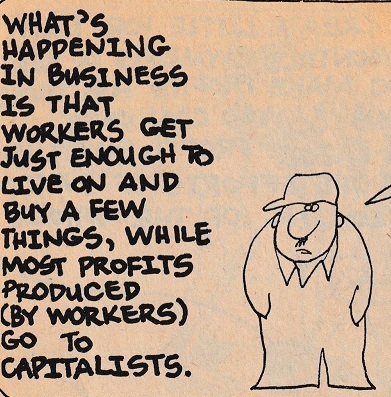 Capitalism depends on the drive for profits, which must take priority over everything else. 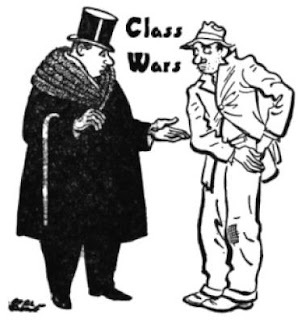 Capitalists compete with each other in the market place and have to keep their costs to a minimum, otherwise they may lose out to their competitors and their businesses may fail. Green measures that may increase business costs will have to be ignored. Nation-states face the same pressures, as they compete on global markets. Governments, which look after the interests of their respective capitalists, seek to protect their lucrative extractive industries. For capitalism, the natural world is an unwanted hindrance to expansion and growth and the ravaging of ecosystems it is of no consequence to capitalism if it means increased profit and productivity. 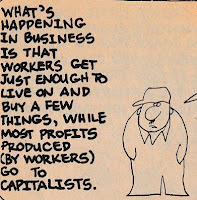 This concern for profits before people is perfectly permissible under capitalism. What’s so wrong about capitalism is how a global fall or rise in the price of even one key commodity can reverse global policy overnight. 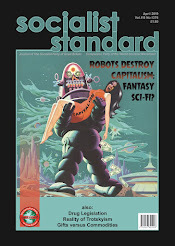 How is humanity supposed to plan for the future, given capitalism's yo-yo economics? How are we supposed to make our civilisation sustainable, and guarantee a planet in good health for our descendants? We can’t. For that we would need a steady-state economy, with patterns of production and consumption that didn’t depend on the stock-market investors. Gambling on share prices is no way to run a planet. We, the working people, must organise quickly to plan production in a rational environmentally friendly way according to human need. Capitalism’s relentless conditioning of people to believe that the way to happiness and fulfilment is the consumerist-obsessed acquisition of more stuff would be a forgotten malaise of the past, the idea that everything needed to be led by an economy and profit an outdated and arcane notion. Socialists no longer seek to conquer and dominate nature but to live in harmony and in symbiotic relationships with the world around us. Socialists are environmentalists who seek a non-exploitative economic system that permits co-operation and collaboration between people, and that recognises the mutual benefits when we also fully understand the responsibilities of our stewardship of the Earth. Our society and our way of life need to be in harmony with nature, not always battling against it, because in a war against the planet and nature there can only be one winner, and it will not be us. While the non-violent direct action and civil dis-obedience tactics of Extinction Rebellion may achieve limited success, at the end of the day they will never be able to combat the motive of profit which is the root cause of the problems they wish to ameliorate and are destined to struggle endlessly against. Anyone who is concerned for what is happening to our environment can now have no reason for standing aside from the case for the abolition of capitalism and its replacement by a social system where people are the priority. Our aim is to sharpen the protesters’ anti-capitalist views to focus our message that capitalism is the enemy, its politicians included and that the capitalist system must be ended.